I was at Market Basket two weeks ago when I was spying around for something a bit healthier and what do I see but "All Natural" slow churned from Friendly's. Really? slow churned and all natural?? Half the fat? extra creamy taste? and all natural? that almost sounds too good to be... whoa whoa whoa, wait! Oh no, I've been duped! 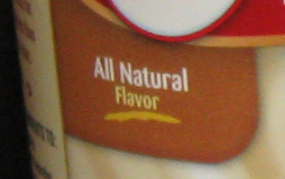 I was so hungry and excited that I missed the fact it says all natural FLAVOR. Oh geez, I was already to issue Friendly's an apology for having ignored their "all natural" low fat line. My bad. I know this isn't a national flavor, but let's see what we find. Looks pretty good. It's definitely got that airier low fat look but still fairly solid. 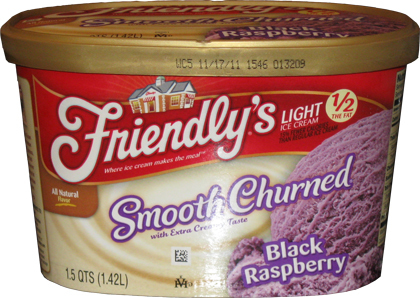 Now for those not lucky enough to grow up with a Friendly's nearby, let me warn you that they make my favorite black raspberry on the planet (though Turkey Hill's Black Raspberry is real nice too). 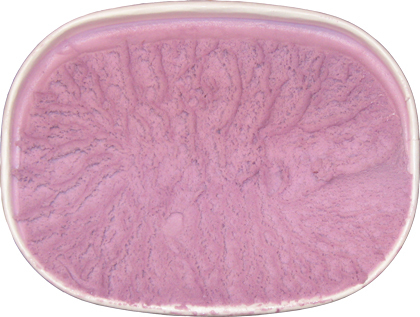 Friendly's BR has always been a very robust textured flavor that also happens to be a very fun shade of purple. There's almost a thickness to the ice cream. I know that's not the best word to use, but it's hard to quantify. It is by no means a bad thickness, in fact, it's what makes their regular black raspberry the best. Time for the taste test.We dig in and... it's pretty good actually. The flavor is similar, that "thickness" to the ice cream is similar, but overall it does not have that same simplicity of their regular flavor. The straight flavor has a good crisp taste, while this is mildly bogged down by that which makes it low fat. Overall, I still like it though. It may not be perfect, but it's plenty good enough for the low fat crowd! On Second Scoop: Just thought I would grab another small bowl before I post this post. Technically I second scooped yesterday, but it was part of a sundae and therefore not a true test. Part of me wants to say that there is a little bit of funk to it that I cant really place. Then the other part of me wants to say that for low fat, this will do just fine. hmmm, if i liked fruit flavored ice cream, and they sold friendly's near me, i'd try this.